Tex-Mex Cuisine is known to be the Texas version of Mexican Cuisine. It is still quite a new concept for me but everyone's raving it. 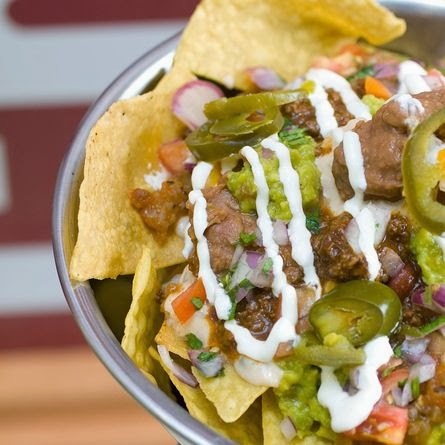 Discussions about Nachos, Burritos, Quesadillas and Fajitas with lots of cheese and Chili con Carne, no wonder Filipinos loved it the second it hit the market. Chihuahua Mexican Grill had been serving the best Tex-Mex cuisine for years. 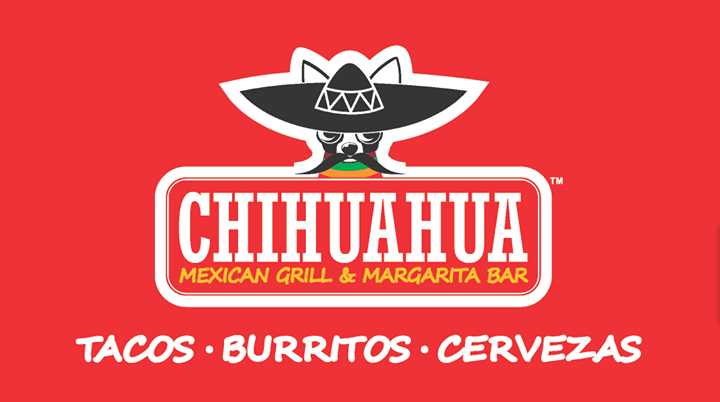 Situated in the busy Makati Avenue stretch, no wonder yuppies from all over the world visit Chihuahua for an authentic Tex-Mex cuisine. 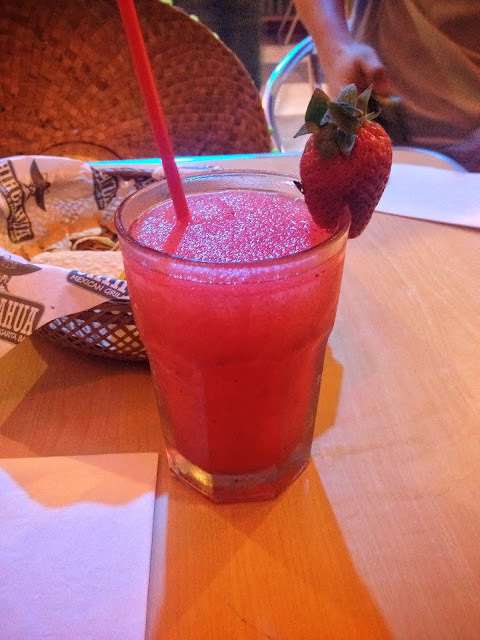 Bloggers were invited to try the new flavor addition to their famous Margarita Bar, the Strawberry Margarita. Chihuahua is known to serve one of the best frozen Margarita in the Metro, taking cue for using real tequila in their drinks. Their Strawberry Margarita was introduced in time for Valentines day. We were greeted by the lovely and energetic Ines, walking us through what dishes to expect. Elias joined us while passionately briefing us the origins of the Tex-Mex cuisine. They introduced us to their new partner in the business, Brian. For starters we were served their Nacho Grande which consists of generous amount of nacho chips topped with queso, chili, guacamole, pico de gallo, salsa, sour cream, grated cheddar and Monterey Jack cheese, and jalapeños. 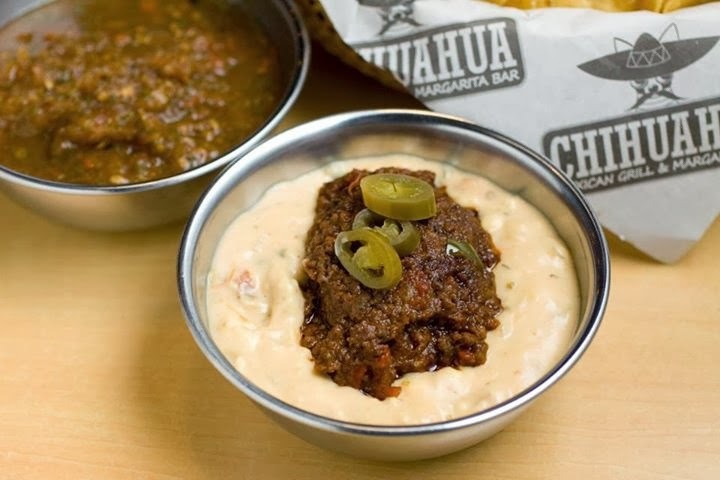 A side of Chihuahua's famous queso dip, chili, chipotle, tomatillo, and habanero salsa were also served as sides. 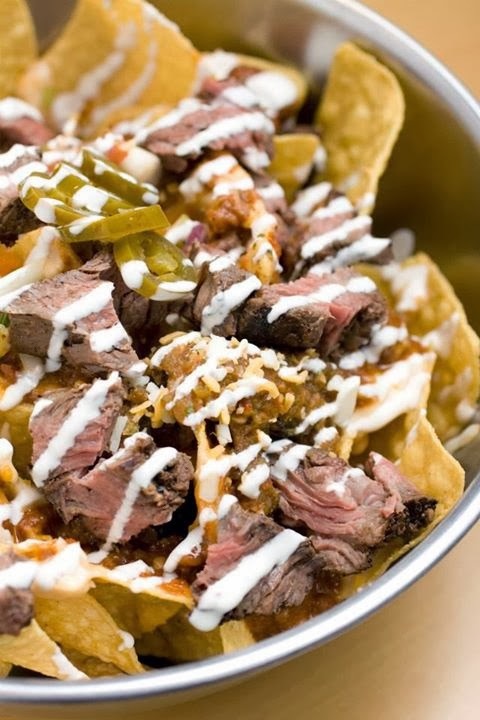 We also got to try their Chicken and Steak Nachos. 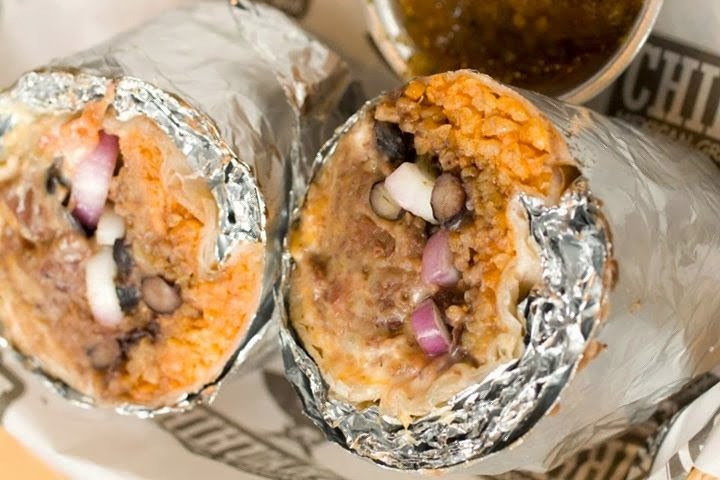 Chihuahua's Steak Burrito is pretty famous, landing the #1 spot in Spot.ph's list of Manila's best burritos. We got to try the Steak Burrito and the Two-Bean Burritos. I am usually not a fan of burritos because of the bean and rice combination, but little did I know, I munching on the two bean burrito that night and even finished half of it in a few minutes. That's how good their burritos are. 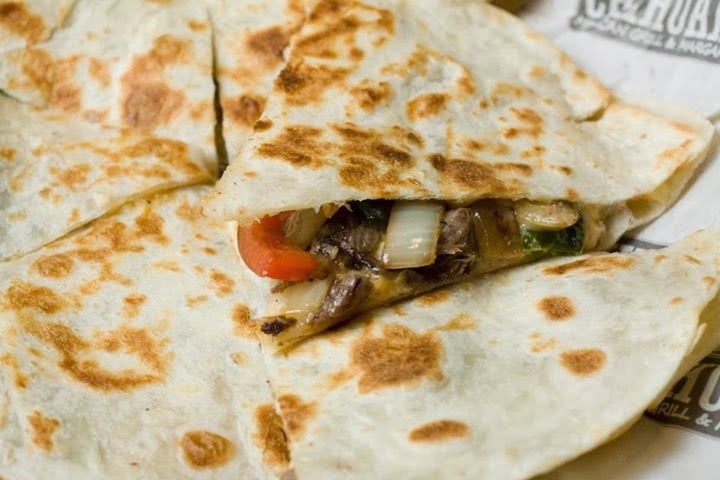 Then comes the Quesadillas. Quesadillas are my default (and favorite) Tex-Mex dish and Chihuahua did not disappoint to make my stomach giddy with their Steak Quesadillas. Those warm tortillas with a savory mixture of meat, vegetables and cheese surely made my tummy happy. And of course for dessert, we tried the Banana-Nutella Quesadillas a-la mode. No words could describe how good this dish is (I'm biased because I love Quesadillas that much). 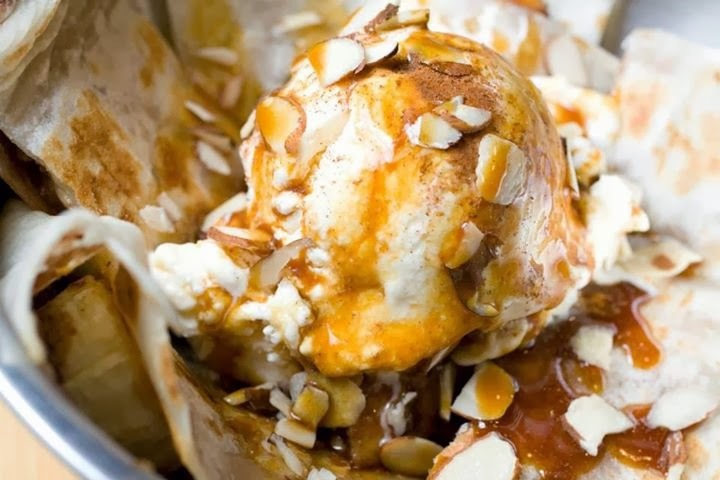 Bananas, Nutella with special Caramel Drizzle topped with Vanilla Ice Cream and slivers of Almonds? It's sinful and savoringly delicious. Mexican Cuisine is known for adding chili in every meal they have. 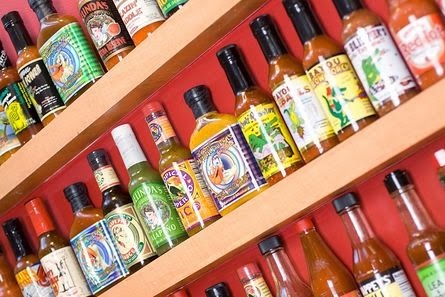 Chihuahua boasts an extensive chili library, where a lot of rare imported hot sauces variety can be spotted. They have different types of hot sauces which are unheard. I love spicy dishes, but in combination with the margarita I gulped down, I painfully made a pass on trying some and my tummy thanked me after. 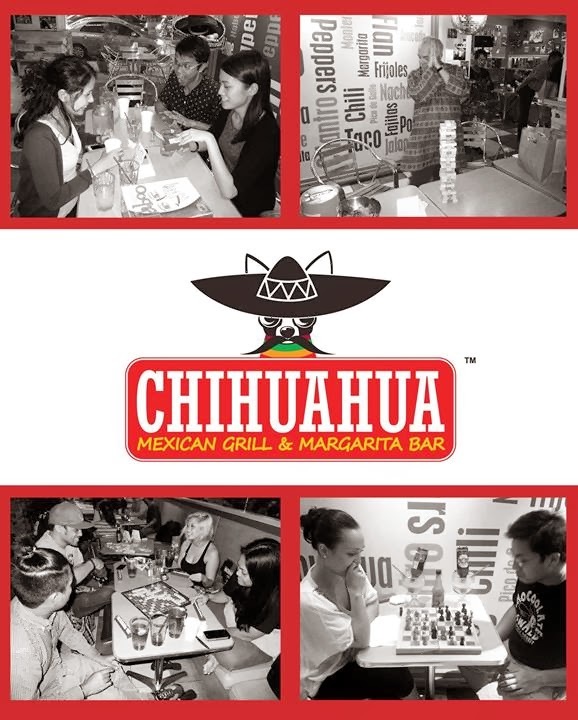 Since Chihuahua is situated in Makati's Nightlife district, surely your dinner date nights wouldn't be a bore. They have a range of activities like Monday Margarita Madness where you can avail of the buy 1 take 1 Margaritas, Acoustic Wednesday, LIMÓN Party on Fridays and Salsa Party on Saturdays. They even have a nice selection of Board Games that you can play over dinner, and hold Beer Pong Games. It's nice to go back and play Beer Pong or even Margarita Pong (if you dare) at Chihuahua for those weekend bonding nights with friends. Thanks Aldous for inviting us to feature Chihuahua Mexican Grill. It was nice meeting Ines, Elias and Brian that night.